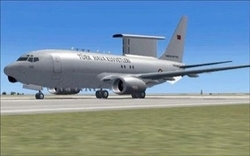 The Government of Israel, we learned yesterday from a Turkish source, has delivered Airborne Warning and Control System (AWACS) equipment by ELTA, a subsidiary of Israel Aerospace Industries, that gives military aircraft protection from electronic attacks. Not only will the AWACS planes, in the wording of the Today's Zaman article, "greatly increase [the Turkish air force's] dominance over Turkey's own airspace" but they will also be useful to it in the Syrian civil war and vis-à-vis "tensions with Israel and Greek Cyprus over the issue of gas drilling." What a Turkish air force AWACS looks like. Ankara ordered the systems years ago but the Israelis held them back following the Mavi Marmara incident in 2010. In part, the Israeli decision to deliver them resulted from pressure from Boeing, manufacturer of the AWACS planes. But in part, it has to do with a hope in Israel that the Turks will again become friendly; this move comes in the context of back-channel talks between the two governments and the decision last week, by Maj. Gen. Eitan Dangot, Israel's Coordinator of Government Activities in the Territories, in the words of Israel Defense, to "allow the entry of Turkish experts and construction materials for the largest Turkish hospital building in the Gaza Strip, ahead the visit of Turkish Prime Minister Erdoğan in Gaza." Israel Defense continues: "There are voices within the Israeli defense establishment calling for the end of the Marmara crisis vis-à-vis Turkey, by finding a formula of apology, in order to return to the Israeli-Turkish alliance against Syria and Iran."